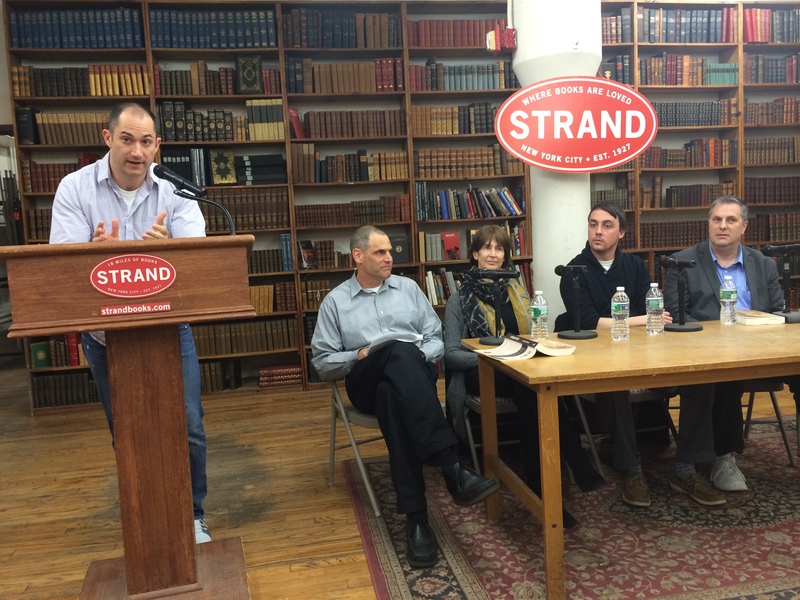 Last week I moderated a reading titled Writers on War at The Strand Bookstore in New York City. 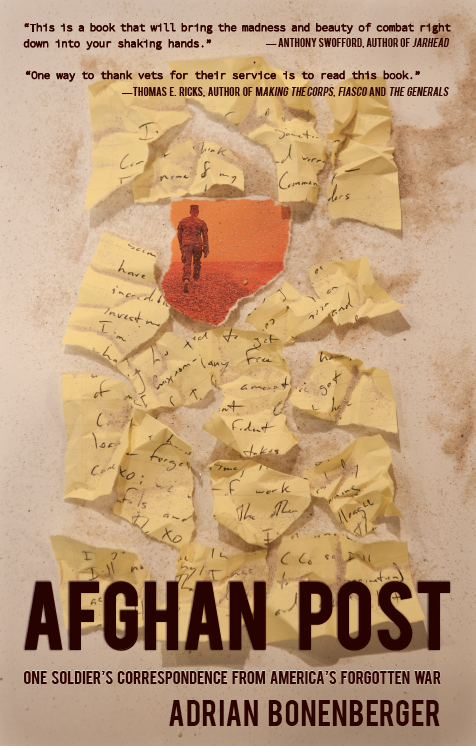 The event honored the publication of Adrian Bonenberger’s Afghan Post, an epistolary memoir comprised of letters and journal entries Bonenberger mostly composed while undergoing infantry officer training at Fort Benning, Georgia, and on two tours in Afghanistan. Also on the panel were David Abrams, Roxana Robinson, the authors of the novels Fobbit and Sparta respectively, and the aforementioned Matt Gallagher. Abrams has written entertainingly about the event on his blog The Quivering Pen and also linked to some funny cartoons of us drawn by a member of the audience named Jess Ruliffson. I can’t top Abrams and Ruliffson, but will say just a few words about Afghan Post. The Afghans live in unimaginable poverty; if you haven’t seen it, you can’t picture what it’s like. Mom, I’m guessing it’s even worse than whatever you saw on the Navajo reservation in the ‘70s. Except replace “alcoholism” with “the ever-present specter of warfare” as the proximate cause of said poverty (I’m trying to be generous and not suggest anything else could be responsible lest others accuse me of cultural imperialism). Walking through the market recently with a dismounted patrol, we passed a butcher’s shop, where they had skinned goats hanging—you could see the cloud of flies around the meat—the butcher’s assistant slapped the corpse to keep the flies off when a customer walked in. That afternoon I had kabob with the mayor—probably the same goat. There’s a medicine here, Cipro, that I take like candy to keep the pathogens away. God only knows what it’s doing to my insides. Our anti-malarial medicine is Mefloquin, which is a weekly pill (we all take it on Monday, which is called “Mefloquin Monday” as a consequence) that causes some seriously weird, super-realistic dreams. I look forward to taking it; the dreams fade in intensity as the week goes on, but Monday and Tuesday night are usually fun, almost spiritual journeys. I had one dream that was so much like reality that when I woke up, I wondered if I’d been to sleep at all, or if I’d just remembered the day before and not dreamt at all—then I thought, “Ah, this what they mean when they say ‘having trouble distinguishing fantasy from reality.’” Although when fantasy is exactly like reality, that’s not much of a problem. The primary recipients of Bonenberger’s correspondence vary greatly—parents, girlfriends, old Yale friends, new Army buddies, etc.–so each is a separate exercise in rhetorical selection and emphasis. Who needs to hear what and why? As the letters accumulate, drama ensues as the author’s relationships torque under the pressure of change and need. The private side the letters reveal is often playful, open, and curious, but also prone to fits of brooding. The dominant impression is that of a young man living through very challenging and exciting events who is both eager to explain it all and desperate for affirmation that family and old friends don’t disapprove of his decisions to join the Army. The letters, it seems, allow Bonenberger, who never intended to stay in, to maintain distance from the all-consuming martial culture he has entered. At the same time, they document the powerful imperatives that drive young officers to fanatically seek the respect of their soldiers, peers, and superiors. The negotiation between distance and immersion imbues Afghan Post with personality and tension that other memoirs sometimes lack. Afghan Post might be read usefully alongside Outlaw Platoon, Sean Parnell’s memoir of service as a platoon leader in Paktika province, Afghanistan, where much of Afghan Post also takes place. Parnell’s memoir swaggers with portraits of soldiers, Afghans, tactics, fighting, and Parnell’s growing prowess as a combat leader; Afghan Post’s strengths are passages that depict honestly Bonenberger’s internal struggle with doubt and failure. While we’re reading Parnell and Bonenberger we might also read Craig Mullaney’s The Unforgiving Minute, about the author’s own platoon leader experience in Paktika and Walt Piatt’s memoir-in-verse mentioned above, about his tenure as a battalion commander there. Something about that wild, far-away battleground, full of mountains and angry Pashtuns, is inspiring America’s fighting men to write very well. Adrian Bonenberger’s Afghan Post: One Soldier’s Correspondence from America’s Forgotten War was published in 2014 by The Head and The Hand Press. This entry was posted on May 4, 2014 at 8:05 pm and is filed under Art and War. You can subscribe via RSS 2.0 feed to this post's comments. So true, Peter. In my recent fb post… sometimes fiction should be allowed to be fiction… I had very similar sentiments. I want to honor the memoirs, but a story that delves further into imagination and is less restricted by facts as lived and perceived by the author can have different effects that are no less “true”. I also think that for veterans who turn to writing to express themselves or to heal, as is sometimes the case, the fewer restrictions the better. Too close a focus on memoir or specific types of war stories in publishing can make veterans whose experiences seem unlike what they read feel left out or silenced. Variety, variety. I continue to really enjoy your blog posts. Thank you for writing them. Thank you as always Lisa! Your point about variety is well-taken. Sometimes I think war lit might hasten the development of tried-and-“true” ways of thinking about and depicting the war, not the development of a wildly free range of imaginative possibilities. Reports by authors representing different subject positions–women, Iraqis, Afghans, officers, enlisted, minorities, etc.–are important, but so are original and creative perspectives as irrespective of author status position as they might be. That’s why I’m thinking that some important contemporary war stories are being written these days that don’t mention the wars at all, or are about other wars prior to Iraq and Afghanistan. A blog post to come…. Those memoirs are great, but you forgot about “The Long Walk” from the Air Force bomb technician Brian Castner. Haven’t read it yet, but it’s on my list! I don’t hate memoirs–I’ve read a dozen or so–I just want to keep Time Now’s focus on fiction, not non-fiction. If I ever get around to writing a book, it’ll probably be a memoir. I really appreciate your thoughts on fiction vs memoir — “the artistic interpretation of war versus its factual rendition.” I share your views on fiction vs memoir but don’t think I’ve ever articulated it so clearly or boldly. Really intrigued by, and looking forward to, your post-in-the-works on “contemporary war stories that don’t mention the war at all.” !! Andria, I think I stated it a little too boldly! I read plenty of memoirs, and life-writing is an important way to get the facts of war out there, as well as the perspectives of those experiencing them. Veterans have important stories to tell, and memoir, along with journalism, history, fiction, and poetry, help us all understand what happened in Iraq and Afghanistan the last 13 years. I’ve got a series of posts coming up on photography in which I explore some of the same issues raised by the fact vs. fiction debate. What is the line between war photojournalism and war photo-artistry? That last question is fascinating — the famous picture of raising the flag at Iwo Jima could fit into that debate (just one somewhat- obvious example, I guess). And I don’t think you were too bold, just honest. Of course all genres are valuable, and a great memoir is far better than a poor or mediocre work of fiction, but I think it’s okay to have favorites and argue for them. Anyone who reads this blog can see that you evaluate each piece on its own merits and honor what it brings to the table. All comments are welcome! Good point about a great memoir vs. a mediocre work of fiction. At this point, I’m not really even interested in making value judgments, I mainly just want to document what’s been done (or being done). But I’d be lying if I didn’t admit that a big reason I started Time Now was my enthusiasm in 2012 for the publication of wonderful novels such as Billy Lynn, The Yellow Birds, Fobbit, and The Watch. Something was going on, I felt, and I was eager to help get the word out. The wars are shaping up to be very literary in ways I don’t think Vietnam and Korea were. Lots of intelligent and curious veterans and non-veteran observers are eager to have their say.